Home > Cables -> Adapter Cables -> DVI to HDMI -> Kramer -> C-HM/DM-0.5 4K HDMI Male to DVI Male Adapter Cable - 6"
4K HDMI Male to DVI Male Adapter Cable - 6"
The Kramer C-HM/DM-0.5 is a 6" HDMI to DVI adapter. The HDMI is male and the DVI is male Single Link on the other. The cable supports 4K resolutions and features gold plated connectors for the highest quality and most reliable connection. 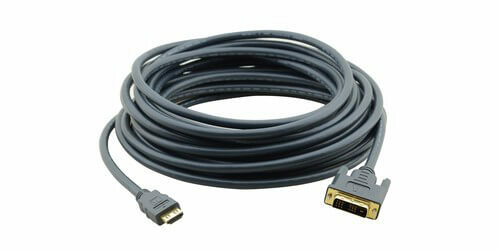 This cable is ideal for going from HDMI to DVI format without having to pay the high price for a converter.